We talk about network traffic in two ways. North/South traffic is the traffic heading in and out of your network, and East/West traffic is the traffic from one server to another inside your network. So why do we focus so much on North/South traffic and almost forget about East/West? As I mentioned in our blog post Identity and Security Starts at Home, the era of Zero Trust means that we can’t trust traffic coming from inside the house. Internal systems can be compromised, and if your internal security is just IP whitelisting or trusted certs, a “trusted app” can do a lot of damage by probing the internal network. And that lateral traffic inside your data center is growing exponentially. Yes, the bulk of threats come from outside the network, and I am by no means suggesting that we should stop working on edge security. But if 20 percent of your traffic comes from outside, the odds are that something in that remaining 80 percent is going to have a better chance of doing something nefarious. So, what do you do? Why, you secure each service in its own security MicroPerimeter™! First, wrap your service in a Docker container — this allows Kubernetes to manage not only the scaling, but, more importantly, the communication of that Docker container with the outside world. When Kubernetes fires up a new Docker container, it pulls the security rules from the Cloudentity Management service. 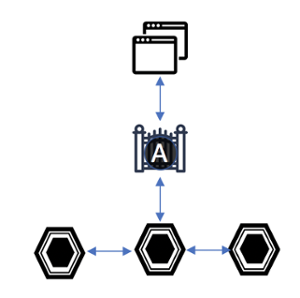 This means that the traffic gets evaluated right at the source — all the allowed rules are loaded by Kubernetes, and all the data you need to evaluate that request comes in with the MicroPerimeter™ JWT. This is a huge change from having to send the traffic North – out of your data center – to call to a third-party authorization service. Evaluating the validity of the request can literally take less than a millisecond, meaning that if you’re currently sending your traffic on a long North/South road trip for security, this model can save you thousands of milliseconds, and, ultimately, a huge savings in hardware, network capacity, and scaled systems. In one sense, we don’t actually make any distinction between East/West and North/South traffic. Traffic is traffic. All traffic needs to be evaluated, and no traffic is trusted. While I still strongly believe in first lines of defense, like API gateways and WAFs, the idea that we don’t trust East/West traffic any more than we trust North/South is fascinating. Does this mean we open our data centers up with no Edge security at all? I’m not quite there, but in a true, Zero Trust world, of course we can. There is no up or down, left or right — just secure services for as far as the eye can see.